First sighting: my second day in Alaska on a hike with friends halfway up Pioneer Peak. Needless to say, I was giddy. First sighting (top right corner) with friends halfway up Pioneer Peak! 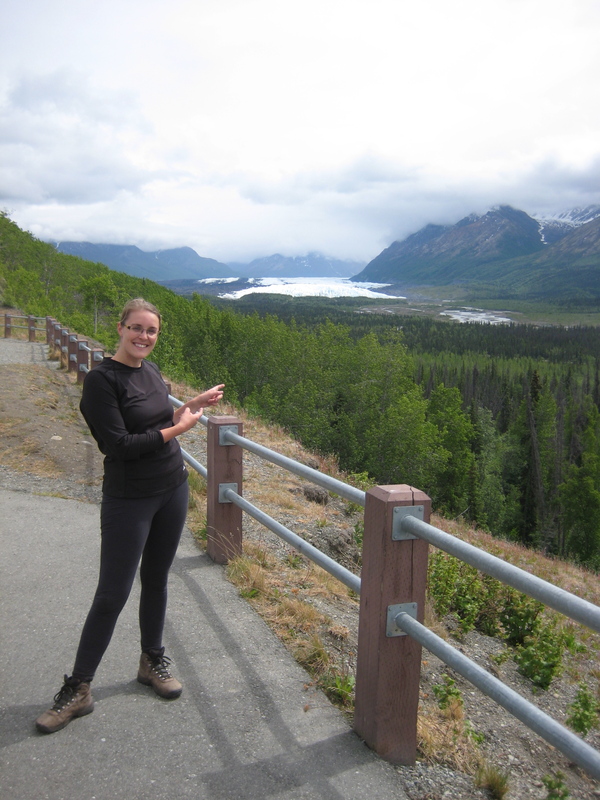 Second sighting: Matanuska Glacier, off the Glenn Highway. Unfortunately, the access point to it is on private land so you have to pay ($20) to see it close up. Fortunately, it was well worth it! On the way in, we reached a sign that said not to pass unless you were with a guide. My friend Skander was with me and happens to know a thing or two about glacier travel so we figured it was okay to go exploring. 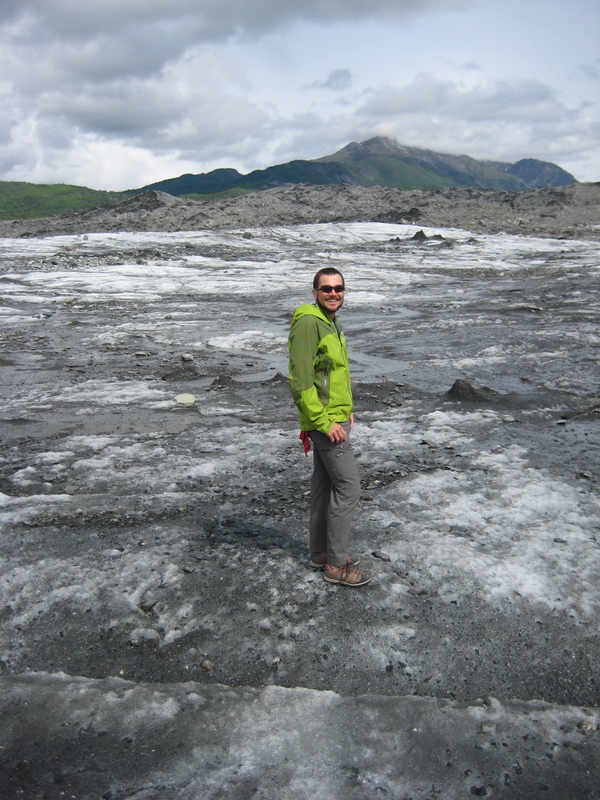 Here I am on the glacier with meltwater streaming behind me. 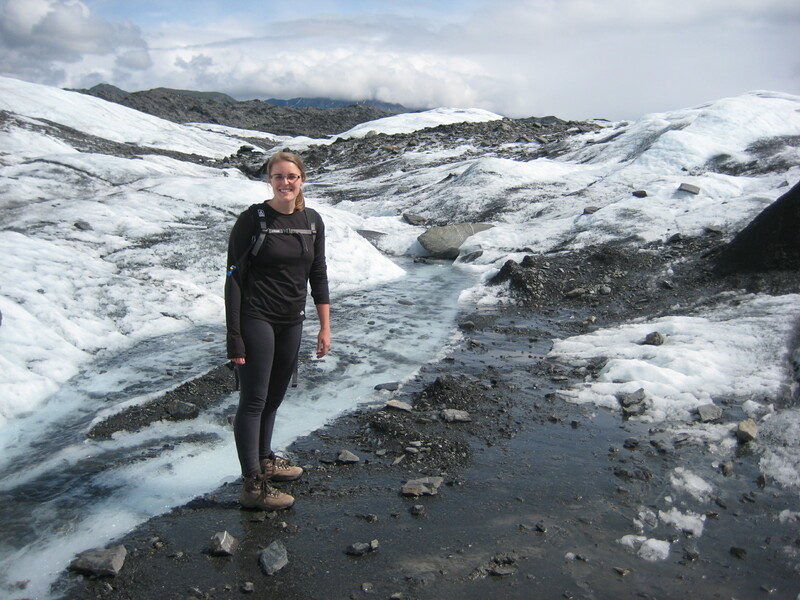 It looks like I’m standing on rocky ground but it’s ice (when you get really close, you can see all the tiny rock particles in it — nature at work). These are just pieces of a fascinating system in a process that starts with snow and hundreds, even thousands, of years later producing the blue glacial ice that we recognize. (Blue because the ice is so compressed it has very little air in it and so it absorbs more red in the spectrum and bounces blue back to us. It’s the same reason the sky is blue on really clear days.) Check out this website for more trusted info on how this stuff works. T’was an awesome second sighting. And, there’s more! 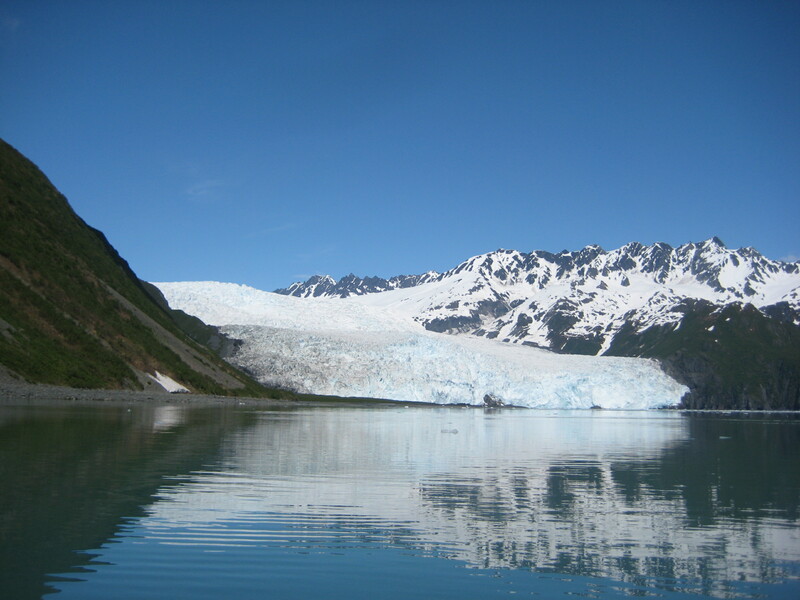 Third sighting: Exit Glacier, Kenai Fjords National Park. Like the Matanuska one, you could also walk up to its terminus. The added bonus? 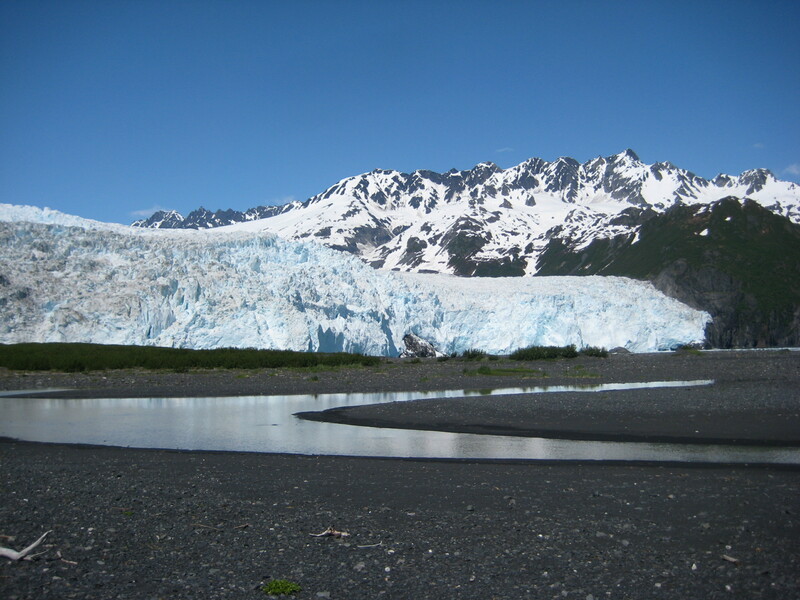 The 3.7 mile Harding Icefield Trail that runs up the mountain alongside the glacier. You gain 1000 feet in elevation every mile but the top offers a full view of the 300 square mile icefield. 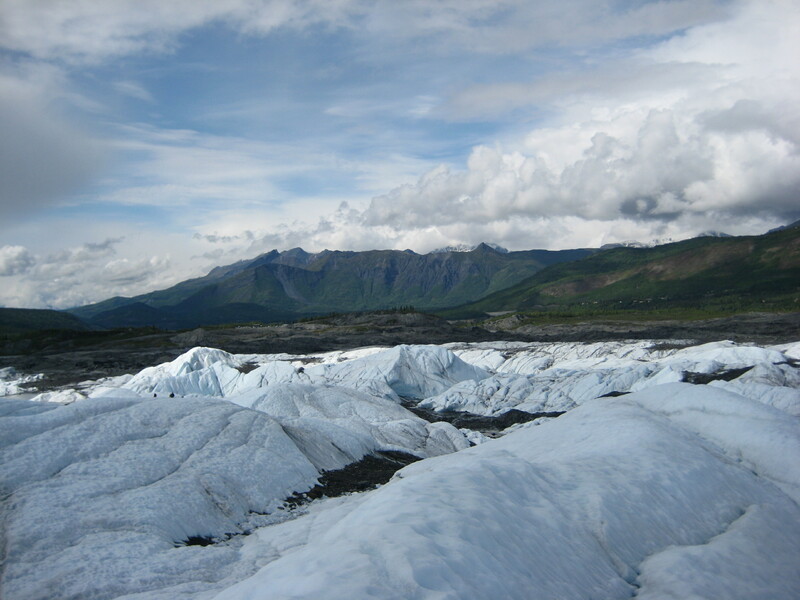 It is one of the four remaining icefields in the U.S. and the largest. One local told me, “it’s as impressive — if not more — than the Grand Canyon.” Unfortunately bad weather hit about 3/4 of the way up so between that, and a low battery in the camera from the start, I don’t have this spectacular view to show you. Another day, perhaps! 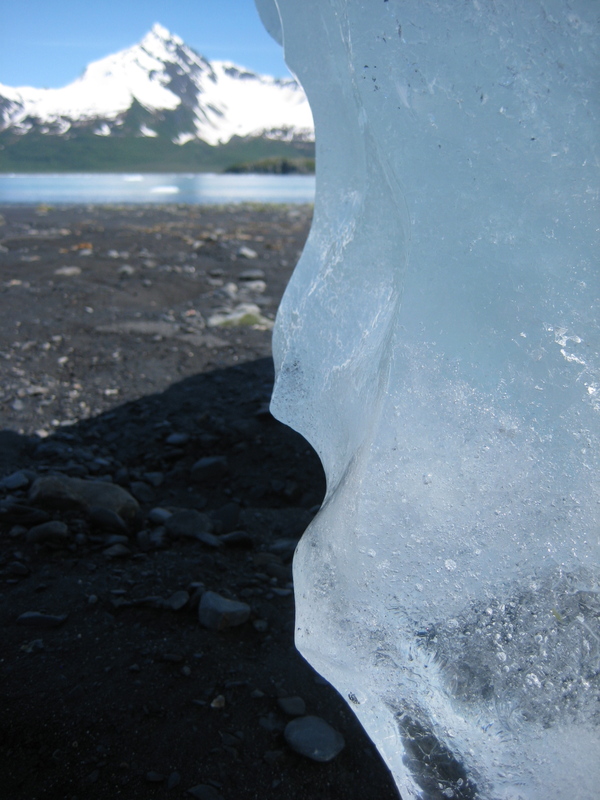 There’s also, I’m sorry to say, a more sobering thing to share about this glacier. At the end of the hike, I went to check out that terminus and found myself standing in places that were covered by the glacier in 2006 and straining to see where it was today. Not 1986; 2006. A year I well remember in detail. 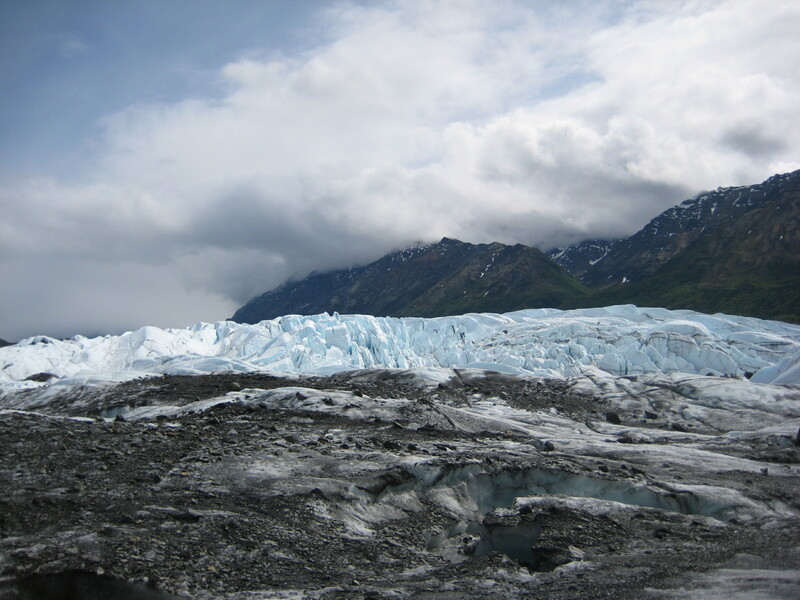 The fact that that glacier has moved that far in five years is alarming. Bill McKibben wrote in a 1997 essay, “Maybe We Should Call It Something Scarier,” that the name ‘global warming’ doesn’t do justice to what we are doing to our earth. It’s more like total rapid inferno. 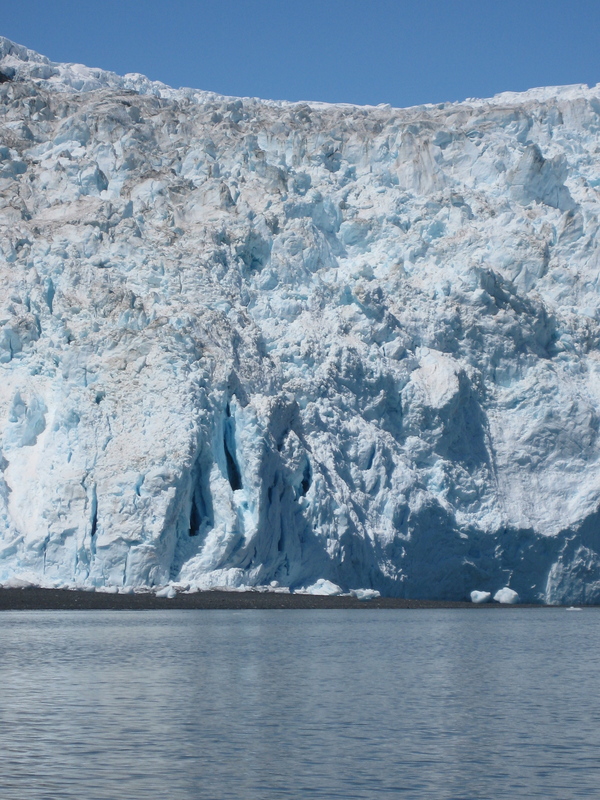 The biggest thought though from seeing this glacier is just how impossible it is to take in. 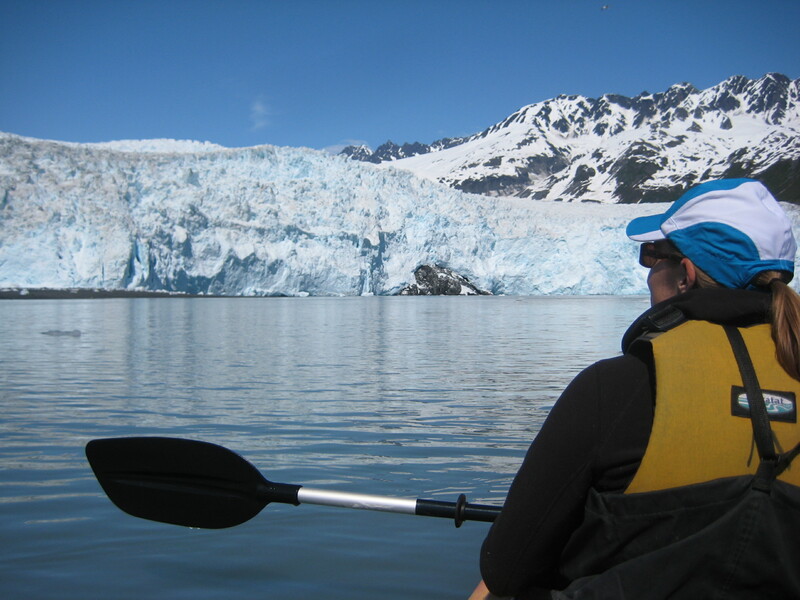 I thought I had a handle on the scale as we started to paddle but, as we drew closer and the glacier remained distant, I knew I was staring at the equivalent of a mountain. Aialik, up close. To give a sense of scale, a cruise ship would only come up to the shadowy part. Truly a changing land. The tides are so drastic ice bergs are sometimes on shore like this one and then floating by the afternoon. A great last look at Alaska...for now. Tomorrow the sun is supposed to come out and I’ll be able to see across the lake all the way to the Green Mountains in Vermont (and they really need the sunshine right now). 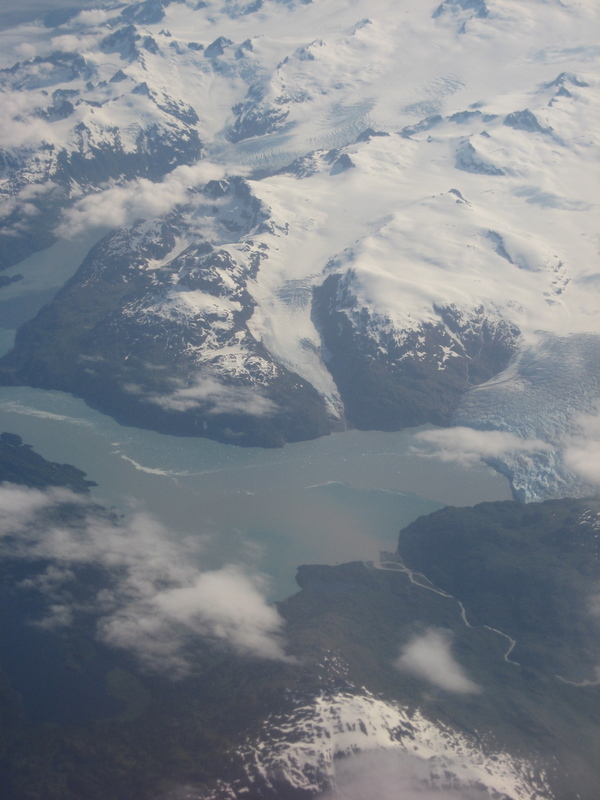 It will be fun to look out and see what traces, what movements, I can spot of that long ago glacier. And although I can’t fully comprehend the time it took to make all that I see, I can now know a little bit more about that beginning, what the changes sounded like, and how it felt to stand among it. *Note: on further investigation (ahem, Wikipedia) it appears I, and this region, might be slightly misinformed about what qualifies as a “kettle.” But I have not found the right word for a deep hole formed by glacial water in a rock so am sticking with kettle for now. 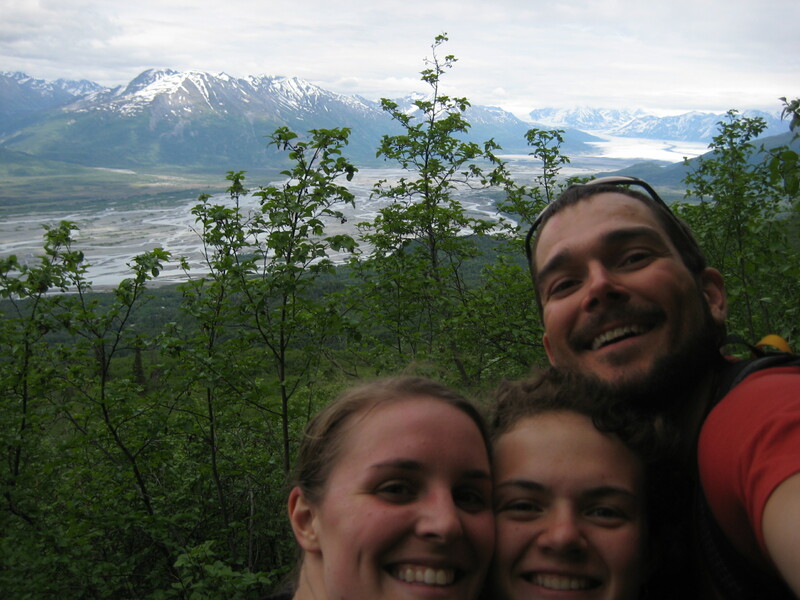 This entry was posted in Alaska, Nature. Bookmark the permalink. With every post I learn something about nature or life; read a thought or phrase to ponder; find a reason to be challenging my conplacency.